Share adventures, learn skills, and gain insights. 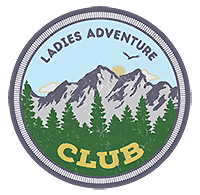 The Ladies Adventure Club is a women's organization that connects members through local events and outdoor activities. A yearly membership is $135. Keep scrolling to learn about all our amazing benefits. Offering Maine women adventure and community and an opportunity to challenge themselves in a supportive environment. Safe, high-quality experiences; kind & non-judgmental; supportive of all members; welcoming to current and new members; honoring our natural environment; empowering and fun. A place to find courage; a place to be bold; a place to be curious and a place to explore. You'll receive a Ladies Adventure Club patch for your pack, a sticker for your water bottle and a list of our favorite adventures. You'll have the opportunity to join half-day, day-long and evening adventures and overnight adventures too; we also host social gatherings throughout the year giving all members a chance to meet, connect and enjoy the company of other LAC members. You’ll have access to a member-only Facebook group where you can find other adventurers for your next hike, bike or kayak. Becoming a member is easy: simply complete the form below and then follow the steps to sign up and pay for your annual membership. We look forward to adventuring with you!